The American Thanksgiving holiday is just over a week away. It is an opportunity for us to pause and acknowledge all we have to be thankful for. Ideally, we should be doing this every day of our lives, but sometimes business and busyness crowd out gratitude. Throughout this year of living kindly, I’ve noticed over and over that kindness and gratitude go hand-in-hand and also bolster one another. When I am in touch with my gratitude, kindness flows naturally and effortlessly. And if kindness feels hard to summon, taking a moment to appreciate my surroundings, my friends and loved ones, or little things that fill me with delight, inspires a surge of kindness. Both gratitude and kindness ask us to slow down. Slowing down isn’t always easy in our overscheduled and over-active lives. I often feel like I’m rushing from one deadline to the next, one obligation to the next, ruled by a lengthy to-do list. But slowing down is essential if we are to notice and appreciate the sunrise, the mushrooms growing at the base of a pine tree, the birds circling overhead like ice-skaters with wings. And slowing down is essential if we are to notice the smile on the cashier’s face, the door held open for us, or the myriad opportunities before us each day to extend our own kindnesses. When I experience gratitude, my heart feels open. It is an experience of abundance and sufficiency. This is all I need. It is also a feeling of presence—what happened five minutes ago doesn’t matter, and what will happen five minutes from now doesn’t matter. I am in the moment. Abundance, too, is a byproduct of kindness. If we believe we are enough, we can easily believe we have enough. Both of these beliefs help us to reserve judgment and extend kindness. And that sense of abundance, whether related to gratitude or kindness—or most likely, both—inspires us to be generous, with our time, our words, our deeds, and our resources. I think it’s difficult to be angry or fearful when one experiences gratitude. I was surer of this last week that I am today, given the horrific events in Paris this past weekend. Those attacks surely brought fear and anger, not just to the people of France, but people all over the world. While there may also be gratitude that one’s family and friends were spared, can gratitude wipe out the fear and anger? I think not. But maybe there can be moments when gratitude at least overrides fear and lets us see that there is much to appreciate even amidst the horror of an attack such as this, or amidst the devastation of a natural disaster, or a personal catastrophe. Maybe it’s gratitude that helps us recover from the worst things that can befall us. Kindness is also our answer to fear and anger. If we can recognize that our impulse to be unkind or say something unkind is a response to our fear or anger, we can often overcome it. If we can recognize that another person’s unkindness is their response to feeling fearful, we can often respond with kindness through that understanding. Fear often inhibits us from acting kindly—fear that our action will be misunderstood, fear that we will be rejected or embarrassed. Choosing kindness over fear is an act of courage. When we are grateful for something, our instinct is to protect and defend it. If we stand in awe at the edge of the ocean, or if we marvel at the canopy of trees above us as we hike through the nearby hills, our natural desire is to shield them from harm, to assure that they will always be there for us and for future generations to appreciate. Our gratitude puts us in service to life—what could be more important? Kindness, too, places us in service to life. It’s our acknowledgment that the ultimate kindness is to honor the Earth and our fellow inhabitants—human and otherwise. A healthy planet and sustainable practices is the kindest gift we can offer our planet and the generations that follow us. It’s lovely if gratitude comes to us frequently and effortlessly, but that is not always the case. Gratitude, like kindness, golf, or piano-playing, is strengthened with practice. The more we do it, the more we experience it and the better we get at expressing it. If you Google “gratitude practices” you will find countless suggestions, from daily meditation, to keeping a gratitude journal, to prayer. I confess that I haven’t yet established a consistent practice, but I try to spend a few moments each morning before I get up thinking about the things I have to be grateful for (the first is always that goofy guy sleeping beside me). What moved or touched me today? Your answers can just be a few words. What you’re trying to do is summon the memory of something that moved you. It’s true. At first this is difficult. You may come up blank day after day. “Nothing surprised me” or “Nothing inspired me.” But if you keep searching, you will think of something. Oh, yes, I was touched when I saw those children playing in the park. And just as Dr. Remen says, with practice you begin to notice things that touch or surprise or inspire you in the moment they happen. That creates an enduring state of gratitude—not to mention presence. Another lovely gratitude practice: For the month of November, my fellow blogger and new friend, Dr. Catherine Cheng—whose wonderful blog, Healing Through Connection, explores (among other terrific things) fixing our healthcare system by improving communications and relationships between physicians and patients—has issued a post daily featuring something in her life that she’s grateful for. Some are things you might expect: her family, good health. Some have surprised and delighted me: Kung Fu Panda, actor George Takei, volleyball…. I look forward each day to seeing what Catherine has chosen to express gratitude for. Catherine’s posts remind me to think about what I am grateful for—both the expected and the quirky. Whether or not we take the time to write them down, daily recognition of big and little things we have to be grateful for is a wonderful way to live in perpetual thanksgiving. This entry was posted in Abundance, Generosity, Gratitude, Kindness and tagged acts of kindness, Extending Kindness, Generosity, Grace, Gratitude, Kindness, Rachel Remen by Donna Cameron. Bookmark the permalink. Thank you, Anand, for your kind words and encouragement. And for reblogging the post on your wonderful site! 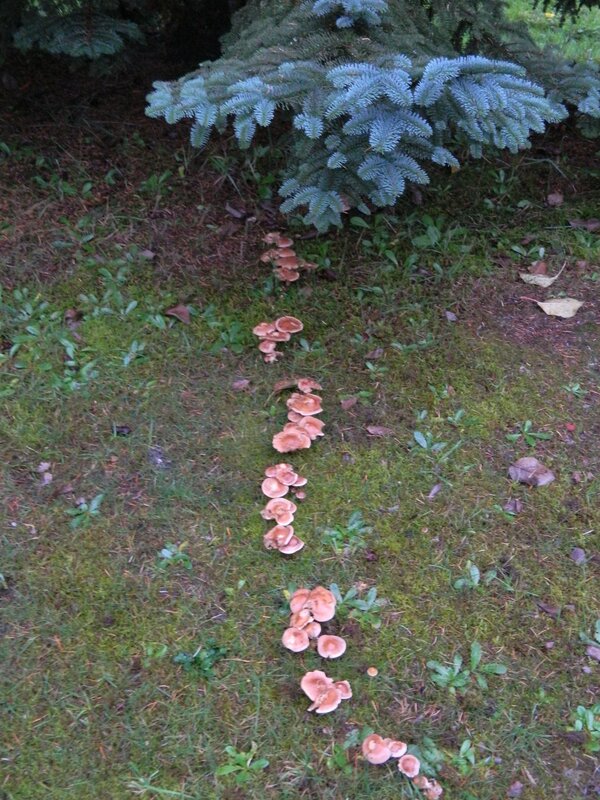 So glad you liked the photo, too, I came across this circle of mushrooms in our own yard and was enchanted by it! A heart full of gratitude is a heart full of compassion and love. I love all lovely quotes and suggestions including the picture in this post. Thank you so much Donna. Thank you so much for visiting and for your kind comment. Wishing you all the best. Thank you, Mick! And welcome to this community of kindness! I am also a student/follower of Rachel Remen. She shares her stories with such humility and grace, and just reading her books fills me with peace–I can only imagine what her actual presence feels like! Maybe someday I will get to meet her. That would really be a blessing! Your Year is almost finished–I wonder what you will do come January 1? I sincerely hope that you will continue writing in public. And if you ever want to compile your YOLK pieces on paper, I will happily contribute time, (relevant) talent, or treasure to help! Thank you, Catherine! Both for your comment and your wonderful examples of gratitude. Yes, this year is coming to a close—I can hardly believe it! I hope to continue both the blog and writing (always my passion). And, of course, kindness. I do hope to explore the idea of a book or other means of sharing the kindness message. Thank you for your generous offer of support. I will definitely stay connected to this tremendous community of bloggers. Thanks, Donna, for pointing out that unkindness comes from fear and anger. I know that unkind impulse, and will try and find the courage to face my fear. Thank you, Carol. It changes so much when I realize and remember that unkindness is so often the result of fear or anger—whether mine or someone else’s. It seems to stop escalation and allow me to respond from a more understanding and compassionate place. I so appreciate your comment! I have been searching for the words to express the importance of gratitude in life and how we should all include it in our lives daily. Donna has captured it perfectly here. Thank you for the post! Thank you, Enkalya, for reblogging on your lovely site! I’m so glad you liked it and I deeply appreciate your kind words. There are so many things to be thankful for, if you just open your eyes and heart to what’s around you. Yes, Therese! You are so right! Thank you for commenting. Donna, this post is rich with insight and is going into my notebook. 🙂 And I second Cathy’s offer with my own: if YOLK’s destiny includes becoming a book, please reach out if you are looking for a reader/supporter/giver of feedback! Nancy, thank you so much for your kind comment, and your encouragement. Can’t tell you how much I appreciate your offer of support and feedback! I will be giving serious thought to the next step in YOLK’s (and my) evolution. All the best. A fine and lovely Thanksgiving to you and Bill, Donna. My gratitude list is gloriously long this year, and you are most certainly on it, my friend. Your insights, suggestions, thoughtful musings and (of course) great quotes have enriched my life; your Being is a gift. Many thanks. Kris, your lovely words gave me tingles. Not sure if you know this, but you were the very first person I ever voiced my intention for this year to. You have always been so positive and encouraging, and your friendship is a true gift in my life. Happy Thanksgiving to you and Paul (and Stella!). Looking forward to seeing you next week and catching up. Thank you, dear friend.